Georg Simon Ohm's father was a rather remarkable man who had educated himself to a high level and was able to give his sons an excellent education through his own teachings and brought them to a high standard in mathematics, physics, chemistry and philosophy. Ohm went to Switzerland where, in September 1806, he took up a post as a mathematics teacherin a school in Gottstadt bei Nydau. His private studies had stood him in good stead for he received a doctorate from Erlangen on 25 October 1811 and immediately joined the staff as a mathematics lecturer. On 11 September 1817 Ohm received an offer of the post of teacher of mathematics and physics at the Jesuit Gymnasium of Cologne.It had a well equipped physics laboratory. As he had done for so much of his life, Ohm continued his private studies reading the texts of the leading French mathematicians Lagrange, Legendre, Laplace, Biot and Poisson. He began his own experimental work in the school physics laboratory after he had learnt of Oersted's discovery of electromagnetism in 1820. In fact he had already convinced himself of the truth of what we call today "Ohm's law" namely the relationship that the current through most materials is directly proportional to the potential difference applied across the material. Ohm's firsts paper published in 1825 examines the decrease in the electromagnetic force produced by a wire as the length of the wire increased. In two important papers in 1826, Ohm gave a mathematical description of conduction in circuits. What is now known as Ohm's law appears in this famous book Die galvanische Kette, mathematisch bearbeitet (1827) in which he gave his complete theory of electricity. Ohm believed that the communication of electricity occurred between "contiguous particles" which is the term Ohm himself uses. Electricity was not the only topic on which Ohm undertook research, and not the only topic in which he ended up in controversy. In 1843 he stated the fundamental principle of physiological acoustics, concerned with the way in which one hears combination tones. In 1849 Ohm took up a post in Munich as curator of the Bavarian Academy's physical cabinet and began to lecture at the University of Munich. Only in 1852, two years before his death, did Ohm achieve his lifelong ambition of being appointed to the chair of physics at the University of Munich. 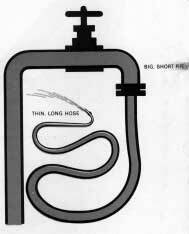 Georg Simon Ohm, a German schoolmaster, showed that current depended on the resistance of the wire circuit it flowed through, just as water flows more easily in a short, wide pipe than through a long, thin garden hose. He went on to state Ohm's Law: that current varies in direct ratio to the wires' resistance. 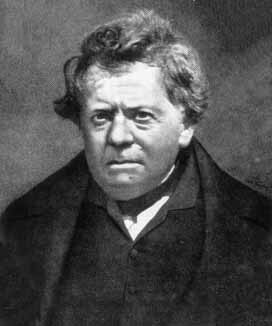 Ohm's theories, published in 1826, were at first scorned and he was forced to resign his teaching post in Cologne. Later vindicated, he became a physics professor in 1849.